In Slovenia, housing construction is growing faster than the population. In 2009, there were more than 838,000 housing units in Slovenia. Most housing units (31%) were built in Central Slovenia, 20% in the Podravje region, with the least (1%) being built in the Zasavje region. In 2008, average dwelling size was 77m2. Slightly more than half of all dwellings are located in urban settlements, where the average size is 71m2. In rural settlements, dwellings are 10m2 larger, on average. This indicator presents the developments in the number of dwellings and population, including size, number, average floor area and age of dwellings, and the average number of persons living in a dwelling. • to promote technological development in the field of building and other materials, doors and windows, energy technologies and systems, information technologies, etc. Contributing more than 40% of greenhouse gases and producing large quantities of waste, human habitation, i.e. people's primary living environment has the largest environmental footprint. Dwellings and dwelling-related construction affect the environment during their construction, during use and afterwards. During construction, this is mainly due to the use of natural resources for various building materials and products and energy supply. During the use of dwellings, the environment is affected by consumption of electricity and fossil fuels used for heating and warm water. Following the use of dwellings, the environment is burdened with waste materials. In Slovenia, waste building materials present one sixth of all waste generated. In Slovenia, the number of dwellings is growing faster than the population. 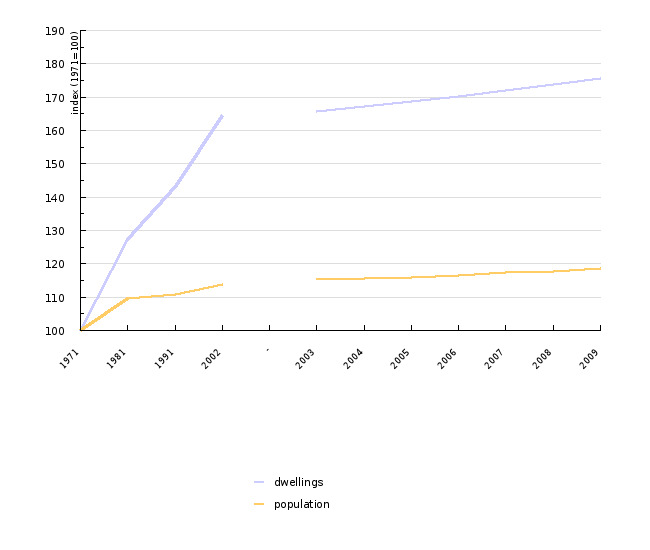 Between 1971 and 2009, the number of dwellings increased by 76%, while the population increased by only 19%. Housing construction was most intensive in the period 1971–1980. According to the Statistical Office of the Republic of Slovenia, there were 838,252 dwellings in Slovenia at the end of 2009. In 2009, 8,561 dwellings were built, which was 2% more than in 2007 but 15% less than in 2008. Most dwellings in 2009 were completed in Central Slovenia (30% of all), mainly in the Ljubljana (1,561, 830 in 2008) and Logatec (395) municipalities. A somewhat smaller number of dwellings were completed in the Podravje region (17% of all), mainly in Maribor (378) and Slovenska Bistrica (208). The smallest number of dwellings was completed in the Zasavje region (0.5% of all). Similar to previous years, most of the dwellings completed in 2009 were obtained by new construction (91%). Construction of large dwellings prevails. In 2009, 46% of completed dwellings had four rooms or more. In 2009, the average dwelling floor area was 77m2. In cities, where half of all dwellings are located, their average floor area was 71.5m2. In rural settlements, dwellings were on average 12m2 larger than dwellings in urban settlements. Since 2004, the average floor area per person has exceeded 30m2, and the average number of persons in a dwelling has been 2.5. 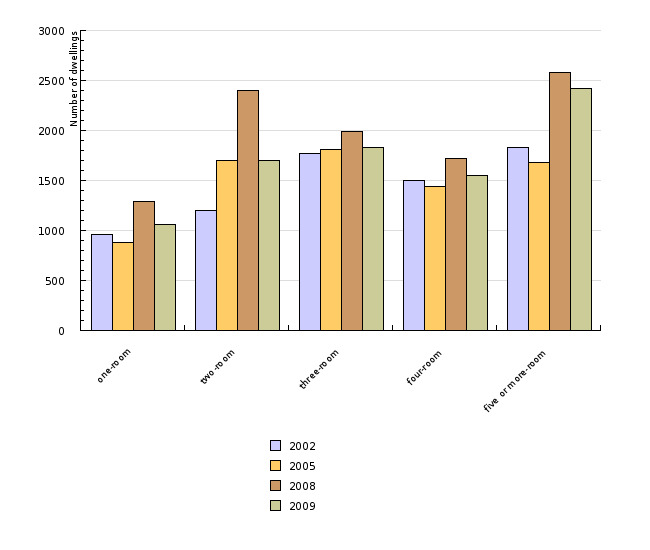 In 2009, 20% of dwellings had no central heating, and 7% did not have a bathroom. Almost half of dwellings (houses and apartment blocks) were old and had extremely poor or no insulation, which causes great heat loss. Most dwellings in multi-apartment units didn’t have a thermostat to control the air or water temperature. District heating systems are often not adjusted to the weather conditions (changes in the indoor temperature with regard to the warmer weather), nor are they adjusted to the requirements of individual dwelling units (better insulation, the number of rooms, etc.). In the last decade, new technologies and the efficiency of heating devices have become more widespread and the number and floor area of dwellings has increased simultaneously. A Study by the European Environment Agency (Environmental Pressures from European Consumption and Production, 2009; according to the Eurostat data for the selected countries) has shown that the construction of dwellings including infrastructure contributes 0.8 tonnes of carbon dioxide equivalent greenhouse gas emissions per person and uses 4.3 tonnes of natural resources per person, mainly for the production of cement, glass, bricks, steel, aluminium, etc. By insulating buildings (outer walls), which represents a large investment, great positive environmental and financial effects can be achieved. Equally important are energy-efficient windows and attic insulation, where investments are lower but long-term savings in energy and costs are nevertheless considerable. In recent years, Slovenia has been granting non-refundable financial incentives through the Eco Fund (Slovenian Environmental Public Fund) for investments in solar heating systems, extensive retrofitting of one- or two apartment buildings and construction of low-energy or passive residential buildings as well as certain individual measures within the retrofitting of existing residential buildings. 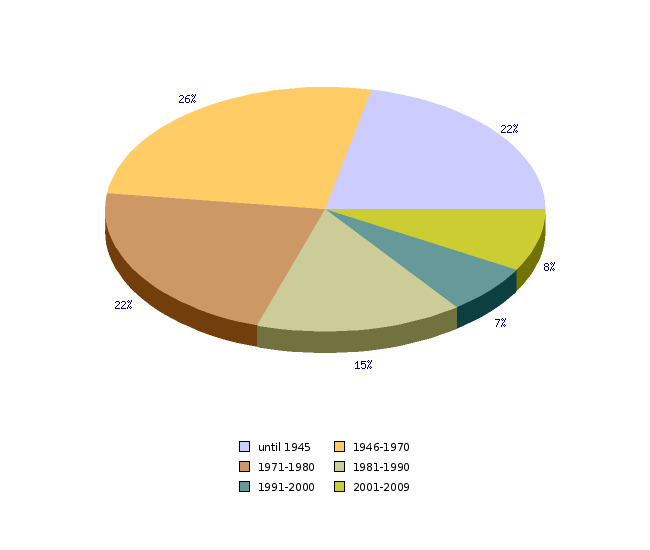 Until 2002, the data sources in Tables 1 to 3 were derived from the Population Census (since 1971 collection of data on dwellings in the Republic of Slovenia has been regularly included in the Population Censuses). The 2002 Census included all dwellings in the territory of the Republic of Slovenia (occupied, unoccupied, for occasional use) and other occupied premises that were used as dwellings in the time of the census (occupied business premises, occupied provisional premises). In the 2002 Census the Statistical Office included building as an independent census unit for the first time. The Census comprised all buildings with dwellings and other occupied premises that were used as dwellings during the time of the Census. The Census did not include the dwellings owned by foreign countries and the dwellings intended explicitly for rental to tourists. The data was derived from the Statistical Yearbook 2006. The census data provided by the Statistical Office of the Republic of Slovenia in cooperation with the Surveying and Mapping Authority of the Republic of Slovenia is in the processing phase and will be available in 2011. The data provided from 2003 on is the data derived from the balance of the dwelling stock, which is a combination of the data on dwellings collected with the Census of the Population, Households and Dwellings in the Republic of Slovenia 2002 and the data collected with regular statistical research. The source of data on dwellings obtained anew is based on estimations calculated on the basis of the data provided by the Monthly Questionnaire of the Statistical Office of the Republic of Slovenia on building permits (GRAD-GD/M). The source of data on dwellings no longer used as dwellings or demolished is derived from the Monthly Questionnaire on Demolition Permits or Permits for Changing the Purpose of the Dwelling (GRAD-RS/M). The calculation includes all dwellings in the territory of the Republic of Slovenia (occupied, unoccupied, for occasional use). As a rule, only completed dwellings are included, in which all construction, installation and finishing work was performed. Exceptionally, the census also covered all uncompleted dwellings if households had already been using them for permanent habitation. Only the section of the dwelling used for habitation was considered, irrespective of the degree to which the building was completed. In line with the definitions of the 2002 Dwelling Census, dwellings for occasional use (holiday dwellings) has also been taken into account, but dwellings in apartment buildings for special purposes (such as homes, dormitories, etc.) has not been considered. The data does not include occupied provisional premises (business premises, huts, cellars, attics, etc.) and collective accommodation (homes, dormitories, etc.). The data also does not include dwellings owned by foreign countries and dwellings intended explicitly for rental to tourists. Methodological differences: Considering the total number of dwellings, the results for 1999-2001 included only occupied and unoccupied dwellings but not dwellings for occasional use. However, since 2002 the total number of dwellings includes occupied and unoccupied dwellings as well as dwellings for occasional use. Data processing methodology: Development in the number of dwellings; the data is calculated according to the index with the base year of 1971. 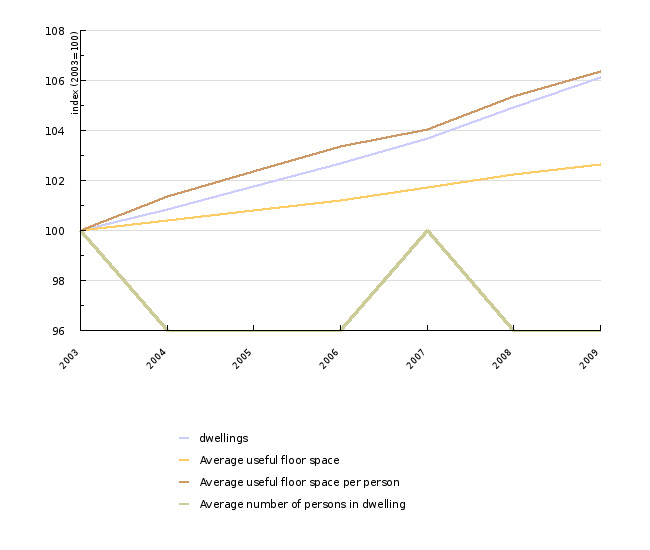 Size of dwellings: The picture presents three selected years (the latest available, middle and first available years) Dwelling number, average floor area per person and average number of persons in a dwelling: The data is calculated according to the index with the base year of 2003 Age of dwellings: Where possible, the data for the periods are combined into 10-year sets.